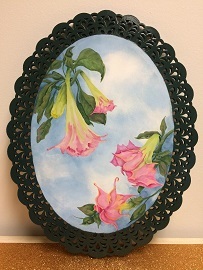 Have fun painting these Angel Trumpet flowers. I painted them on an 11x15 inch oval lace plaque. These plants can grow 6-7 feet tall. All my pattern include FREE shipping! Fun drink coasters to for your kitchen. This pattern includes instructions for both acrylic on cork coasters or porcelain coasters. All my patterns include FREE Shipping! Special gift for a blessed event, the birth of a child. Can paint pink for girls or blue for boys. All my patterns include FREE Shipping! Plain Porcelain Booties are available to purchase under Merchandise. Cute little chipmunk after the seeds surrounded with pumpkins on a porcelain boot. All my patterns include FREE Shipping! Plain Porcelain Booties are available to purchase under Merchandise. Fun to paint Cardinals and Black Capped Chickadees in the winter. Great to give as a gift or to hang on your tree. Painted on 4" wood ornaments. All my patterns include FREE shipping! Painting Beautiful Sunflowers and a Goldfinch will really brighten your day. This painting was taken by a friend J Marie Schwab she gave me permission to paint it. When I saw this photo my smile lit up, the way I imagine the Goldfinch felt looking into the morning sun. All my patterns include FREE Shipping! Always know your suitcase when it comes down the luggage carousel. Paint beautiful Pansys on all sides of the suitcase. All my patterns include FREE Shipping! Colorful Poppies adorn this suitcase front & back. You will always know your suitcase on the luggage carousel. All my patterns include FREE Shipping! 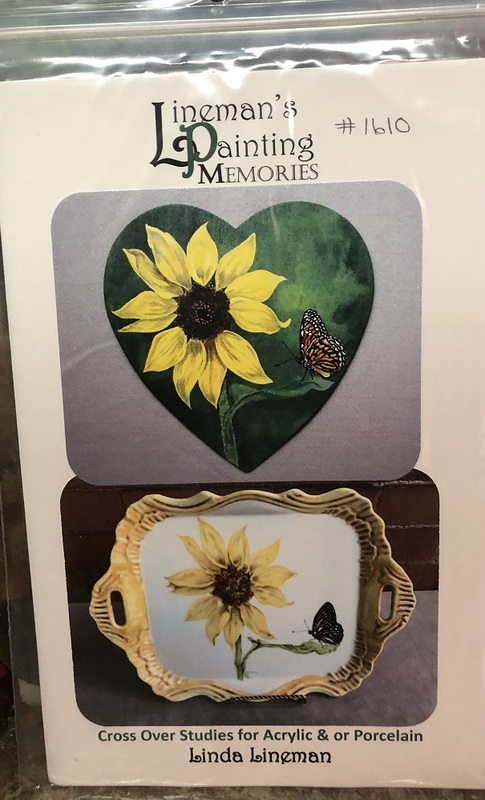 Sunflower & Beautiful Butterfly on a wooden "Art Minds Heart" from Michaels Craft Store or painted on a porcelain tray. All my patterns include FREE Shipping!